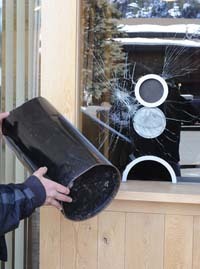 Ketchum police are investigating vandalism sometime Sunday night at Magic Lantern Cinemas on Second Street in central Ketchum. Police Chief Steve Harkins said his office was notified Monday morning. He said two acts of vandalism occurred. First, someone used an ash tray can to smash a ticket window and second, someone toppled a decorative old movie projector that is located at the front of the building. Damage was initially estimated at about $200. Harkins said the incident remains under investigation.